The started to earn the reputation for being lucky when regulars David and Kath Long won £1 million in 2013 and another £1 million in 2015. But just last month the pub won its third lottery million. 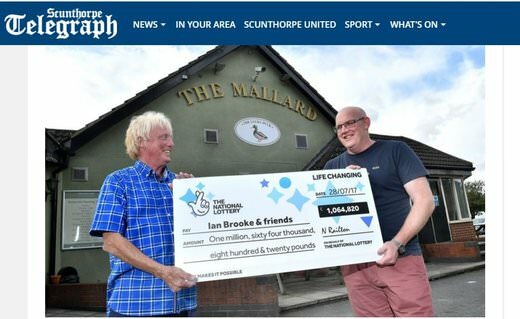 This time it is the pub landlord, Ian Brooke who posted the win. To celebrate the good fortune, Brooke had new lucky duck signs installed. The lucky winner says he thinks his pub may be the luckiest one in the UK, and apparently people in the area agree. Lots of new customers have been dropping in for a pint in the hope that they can share in the lottery luck. Visitors to the town of Scunthorpe now say a visit to the town will not be complete without having a pint or two at the Mallard. As for the latest winner, he immediately gave a quarter million pounds to two of his closest friends. This was to honor a pledge they made that if one of them wins the lottery, the other two will receive a share. Brooke is now enjoying his winnings and the sudden boom in his pub. And he’s still hoping for a second win.